Mt. Bonnell ~ Austin, Texas - R We There Yet Mom? 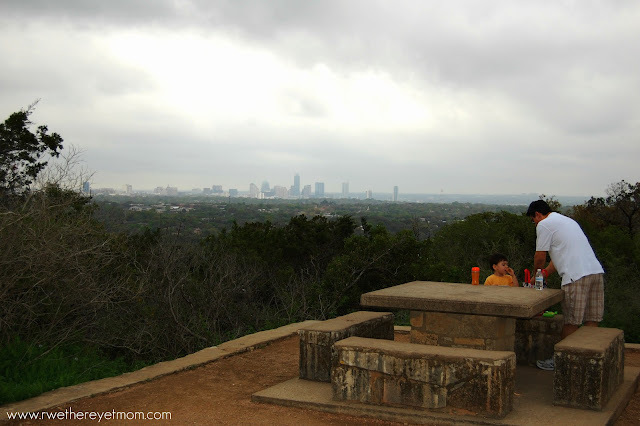 When we first moved to Austin, I compiled a list of “must dos” as newcomers to the city. Based on the advice of neighbors and fellow Austinites, everyone said I had to hike Mt. Bonnell. Of course, I pictured a tall mountain in the middle of Austin that required hiking boots and a walking stick to climb up. Not the case my friends…..
Mt. Bonnell is not a mountain and it is not in the middle of downtown Austin. 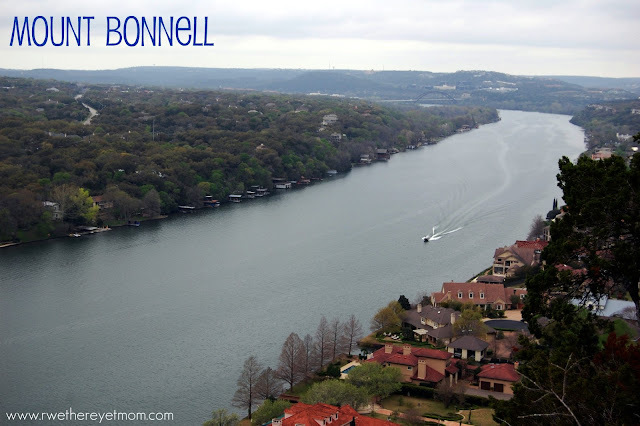 It is however a gorgeous hill that overlooks the Lake Austin portion of the Colorado River. And with a short “climb” up a small set of stairs, you reach the summit fairly quickly. Mount Bonnell is listed as a Historic Texas Landmark and has been a popular tourist destination since the 1850’s. 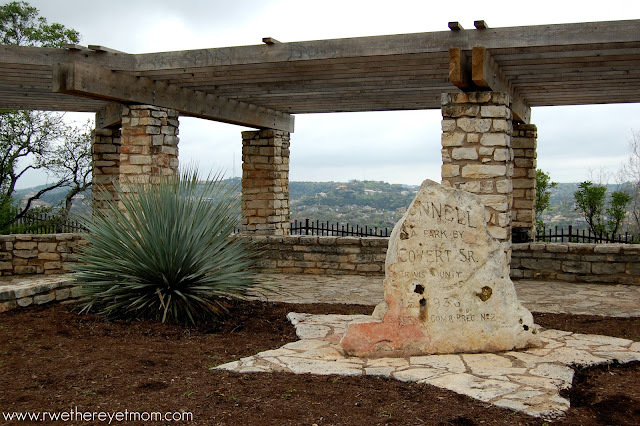 And as I tried to read up on the history of Mount Bonnell, would you believe that I found 4 different stories as to who it was named after floating around the old internet? 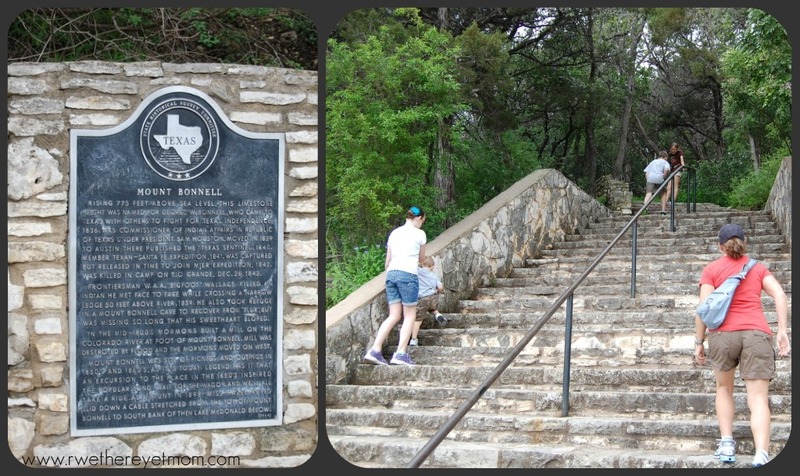 Regardless of if it was named after a Captain in the Texas Army during the War for Independence or a popular newspaper publisher, it is a FUN outing with the kids! My kids scrambled to the top to catch the spectacular views of Lake Austin. As disappointed as I was for the overcast day (hence the not-doing-it-justice-pictures), the kids loved pointing out cool pools they saw, boats, bridges, and even a helicopter that flew at our height. What I loved is that you can turn right around and see downtown Austin in the other direction. Several families had brought lunches up here to enjoy, as there are a few tables to sit at – I love it! We spent most of our time exploring all the trails the take you around the Covert Park area. Big wide ones like this are perfect for the little ones. Some areas do not have a fence or railing, so please watch your kiddos closely. So after 4 years, I can check this one off my To-Do list. But it is not like this is a one-time visit for us. I can’t wait to come back at sunset with my hubby for a date! Ohhh…how romantic! Good to know: Wear comfortable, rubber-soled shoes; lots of stairs to climb to get to the top; some areas do not have a railing, so watch your kiddos! 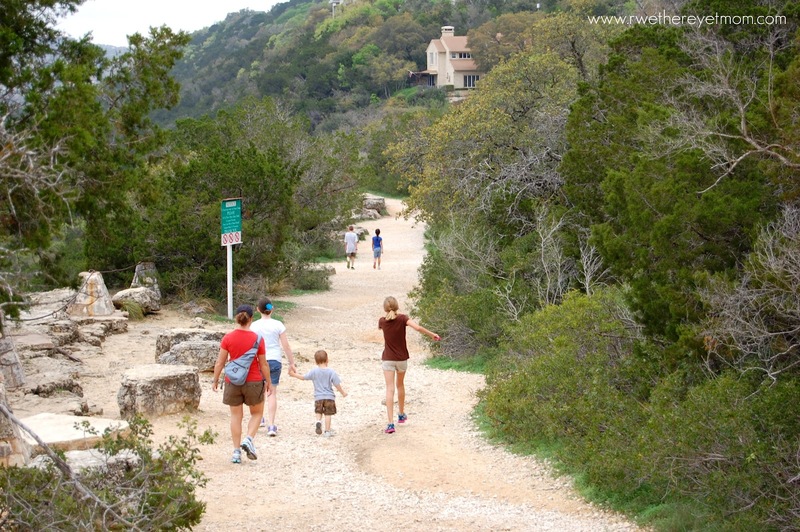 That looks like a great spot for a hike – nice that it’s not too steep so that the kids can join in the fun. I love Mt. Bonnell. We were brave enough to visit it last summer – mid-season. Took our jug of ice water, for sure. I wish people wouldn’t litter up there. The view is awesome, though!